Since 2009, Calgary First Aid has been the number one training service provider for first aid and cardiopulmonary resuscitation (CPR) in the area. They are the biggest and most popular provider in Calgary because of quality classes available at really affordable rates. Enrolment is easily completed as well through the registration form below. Choose a program and enrol today! Before registration, you can choose a course from the list below or on the Calgary First Aid website. Enrolment can then be completed via e-mail, telephone call, or walk-in during business hours in any of the facilities in Alberta. You can reach the Calgary First Aid staff with the contact information below. The main training facility is situated just outside down town Calgary. It has great access to public transit with newly-built C-train station just across the street. Restaurants, shops, and free parking are available nearby as well. You can refer to the map below for directions. Calgary First Aid offers the lowest rates and prices for its St Mark James CPR and first aid classes. You only need to pay the fees during enrolment and Calgary First Aid assures you of no additional expenses. All the rates below include taxes, certification, and training manuals. If you decide to drop out of a program, you will receive a full refund if you give a 72-hour notice beforehand. 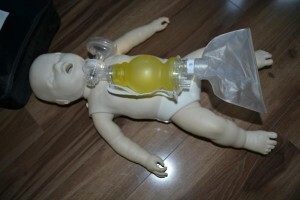 Full courses for CPR are available in three levels, all inclusive of first aid and AED training. AEDs or automated external defibrillators are machines that are attached to the chest with pads and are able to detect heart rhythms and apply needed shock to the heart. Stand-alone CPR/AED and stand-alone first aid classes are offered to trainees who do not want to enrol in the full course. If you want to get trained at home or book an instructor for a company event like a conference or outing, private programs are offered at Calgary First Aid as well. Hourly rates vary so just send an e-mail or give a call if you want to inquire about booking a private instructor. 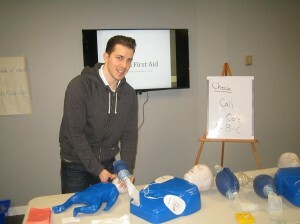 Other work-related training programs are also offered at Calgary First Aid. St Mark James Training awards the trainees certification for training after the completion of a training program. Within three years, while the award is current, the certificate can be renewed through refresher programs. Refresher programs are held twice a week at Calgary First Aid. If you work in the child care or day care industry in Alberta, you are required to have child care first aid certification. St Mark James offers two level’s of certification, emergency (8 hours) and standard childcare first aid (16 hours). The industry requirements in Alberta state that candidates must take a two day course which requires candidates to attend the standard childcare first aid option. When registering for a childcare first aid course in Calgary make sure you know your workplace requirements prior to registering. You can also contact this provider for more information.